Buildings and ruined masonry on the river bank, Colgong (Bihar). bl.uk > Online Gallery Home	> Online exhibitions	> Asia, Pacific and Africa Collections	> Buildings and ruined masonry on the river bank, Colgong (Bihar). 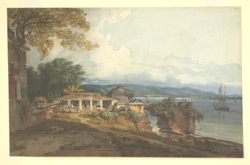 Water-colour painting of buildings on the river bank at Colgong (Bihar) by Robert Smith (1787-1873) between 1814 and 1815. Inscribed on the original mount in pencil is: 'Colgong.' The paper is watermarked 'VEIC 1807'. Colcong or Kahalgaon is in the Bhagalpur District of Bihar situated on the south bank of the River Ganges. The last independent king of Bengal, Ghiyas-ud-din Mahmud died here in 1539 after the sack of Gaur. There is a rock hewn temple on this site which is considered holy by Hindus as the river turns to the north here. The temple once contained several fine pieces of sculpture and appears to have been visited by the Chinese pilgrim Hiuen Tsiang.